Sound strapping for an unseemly outburst: Pandora Blake gets a sore bottom Discipline is at the heart of Henry Higgins home. New maid Pandora Blake has an outburst at his niece Amelia Rutherford and the result is a bare bottomed strapping to bring tears to her eyes, kneeling on Amelias bed. 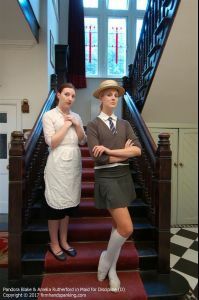 Amelia is a spoilt brat and poor Pandora suffers after being goaded about her imprisoned father in Maid for Discipline.